I'll know you will always be there. I'll know that you watch over from above. Grant him your laughter and joy. Than my little baby girl. We’ll know you will always be there. On our wedding day, we collected fabric from our friends and family. I was sewing it into a wedding quilt when this song came to me. A few weeks later, our son was born prematurely in an emergency C-section due to a placental abruption (severe hemorrhage). We both lost a lot of blood and he nearly died. Through the morphine, this is the song I did my best to sing to him just before he was taken to an ambulance and transported to a larger hospital. Because I was still recovering myself, I could not be moved with him. It was then that I was profoundly grateful that the angels had done what they could to prepare me for his birth and our separation. 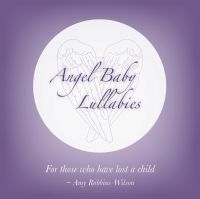 And now, I am grateful to be able to share this adaptation of the lullaby with the parents and families of angel babies. To learn about the original version that I sang it to my son that day, visit Angels Watch Over My Baby (boy version). You can find the version for girls here.